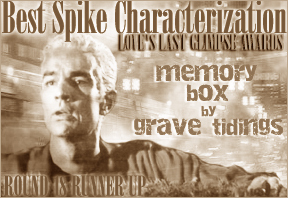 WINNER -- Runner-Up for Best Spike Characterization in 18th Round LOVE'S LAST GLIMPSE AWARDS. WINNER: JUDGE'S CHOICE IN THE 5TH ROUND OF THE FANG FETISH AWARDS. Nominated for Best Love Story, Most Original Fiction and Best Spike Characterization at LOVE'S LAST GLIMPSE 18TH ROUND AWARDS. Nominated for Best Spike Characterization in Best of 2006 LOVE'S LAST GLIMPSE AWARDS. Nominated for Best WIP in Round 6 of the FANG FETISH AWARDS. Nominated: Best Fluff, Best Short at the 5th Round of the Fang Fetish Awards. WINNER BEST SUPPORTING CAST (ORIGINAL OR SUPPORTING CHARACTER) IN ROUND 6 OF THE FANG FETISH AWARDS. 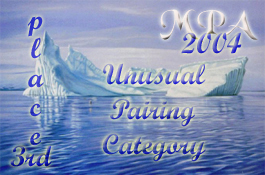 Nominated: Best M/F Pairing with a Vampire, Best Supporting Cast, and Best Short Complete Fiction in Round 6 of the FANG FETISH AWARDS.